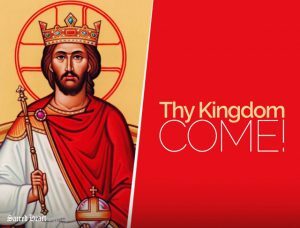 Jesus affirms that he is a king, but he also affirms that his kingdom does not “belong to this world.” If his kingdom is “not of this world,” what kind of kingdom is it? “Jesus did not come to rule over peoples and territories, but to set people free from the slavery of sin and to reconcile them with God.” (Pope Benedict XVI) Ever since original sin, this fallen world has been enslaved to selfishness and separated from God. And what will set us free from sin? The truth that God is love. By accepting God’s love in our life, we accept the antidote to the poison of selfishness and are reinstated as citizens of the Kingdom of God, where Christ is the everlasting King. Ask yourself a simple question: how am I building Christ’s Kingdom in in my world? It’s a kingdom of peace, love and joy. How do I bring that into my work and relationships?